How soon is soon? Weeks? Months? External drive support will be coming to Xbox One "soon", according to an anonymous leaker on Reddit. The teasing picture (shown above) was posted on Reddit yesterday but the leaker was not forthcoming with any other details. 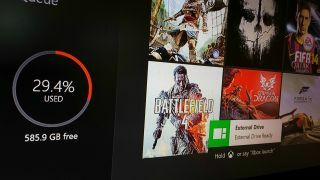 Developers and members of the Xbox One preview programme get access to early updates and it's therefore possible that external drive support will feature in the next mass update. Microsoft product director Albert Penello previously announced that external drives were always part of the company's plan. While the Xbox One comes with a hefty inbuilt 500GB of storage, games are increasingly taking up more and more space. With titles like Titanfall, which commands 20GB of storage, starting to pile up, external hard drive support needs to hurry up before our consoles reach bursting point. We've contacted Microsoft to ask when this support might be coming, and we'll update when we know more.